Gaige, Di Felice, Feenstra Kuiper, Renette and Zavatarelli, and La Grande Storia degli Scacchi are all in agreement with regard to the results, though Gaige does not include Stern, only indicating that some sources score all of his games to his opponents. Feenstra Kuiper and Di Felice indicate that Stern withdrew after playing 2 opponents, and that his scores were struck out, despite his having drawn one against Steinitz and won one against von Minckwitz. The Illustrated London News (Aug. 6) indicates that Stern lost both games against von Minckwitz and then after two rounds had a score of +0-4=0. The Westminster Papers (1 Aug. 1870, vol.3, p.49) also says Stern lost both against Minckwitz, and on p.58 shows a score of +0-4=0 for Stern. Feenstra Kuiper and Di Felice show a win and a loss for Stern against Minckwitz. I will accept the contemporary reports. Tim Harding tells me (from the Deutsche Schachzeitung, Dec. 1870, pp.313-314) that the game recorded as a draw between Stern and Steinitz was actually lost by Stern on time. Then they played the game out and Stern obtained a draw, but Steinitz cannot be considered to have been playing seriously at that point, so I will record it as a loss for Stern. Renette and Zavatarelli also show two losses for Stern against Minckwitz and also against Steinitz. The Illustrated London News of 27 Aug. 1870 (p.227) and the Era of 28 Aug. 1870 (p.7) give the complete crosstable with the 5 defaulted games scored as if played, and gives Stern 0 across the board. These two sources also have an inconsistency in giving the 2nd Anderssen-Winawer game as a win for Winawer in one place and a draw in the other. Other sources give it as a win for Winawer. Harding also says that in one of the Paulsen-de Vere games, Paulsen overstepped the time limit, but de Vere refused to claim the win. They were then allowed to replay their game and Paulsen won. I will ignore the initial, uncounted game. Feenstra Kuiper, Gaige, Di Felice, and Renette and Zavatarelli all indicate that Rosenthal lost both games by default against de Vere as well as Minckwitz, and Minckwitz lost one by default against Paulsen. These forfeits are not mentioned in the Illustrated London News, the Era, the Westminster Papers or the Chess Players' Quarterly Chronicle. 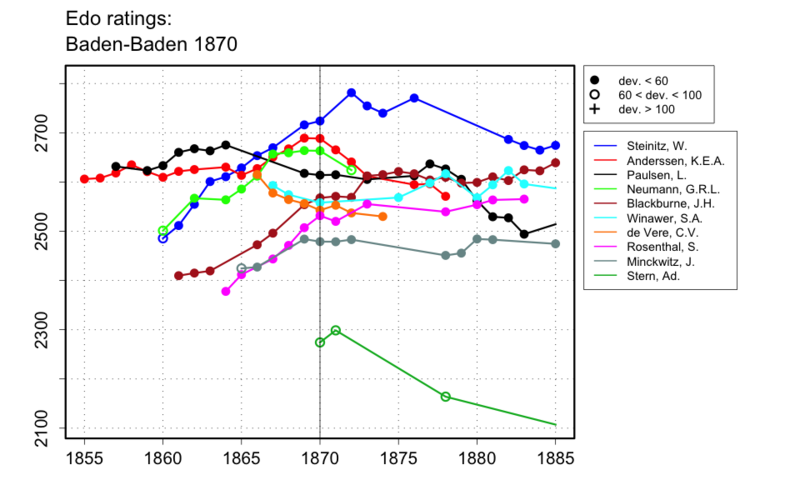 The Westminster Papers of 1 Sep. 1870 (vol.3, p.72), while critical of other contemporary reports, has a crosstable that shows a win and a draw for Steinitz against Rosenthal, but two losses for Rosenthal against Steinitz, and thus a faulty total for Rosenthal. The Chess Players' Quarterly Chronicle simply reproduces part of the report from the Westminster Papers.